Group with truck (probably a GMC) loading or unloading for a picnic. People not identified, probably Mrs. Woodhouse at far right, maybe Katharine Baily (her family was located at the salt works) or Mrs. Cadman standing next to rear wheel of truck. 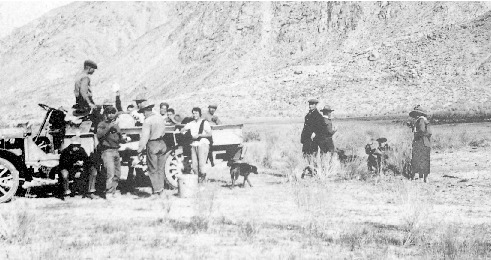 unknown, “Picnic at the Lake,” Deep Springs Archive, accessed April 22, 2019, http://archive.deepsprings.edu/items/show/1410.